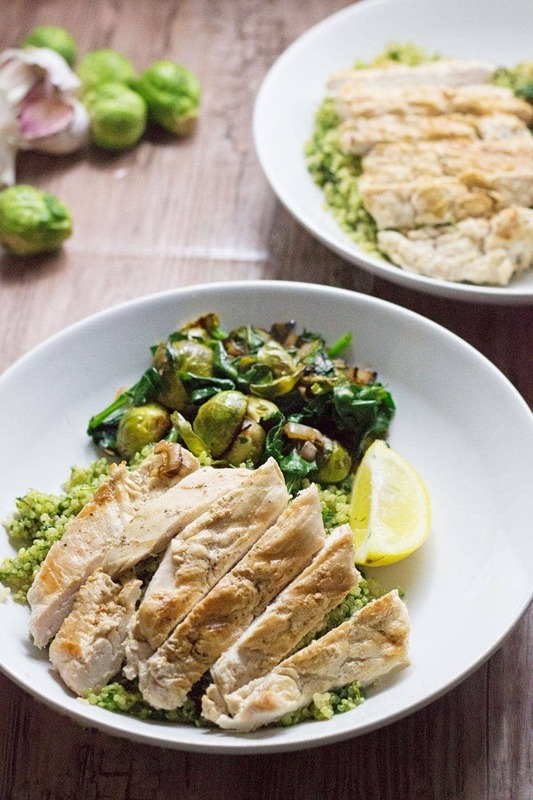 Looking for a delicious and healthy weeknight dinner? 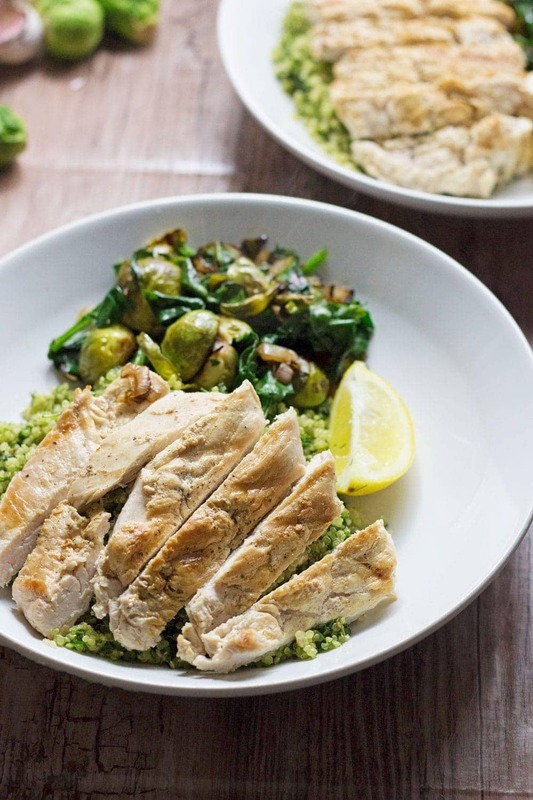 These healthy green quinoa bowls topped with chicken are the perfect thing! So Will and I are trying to decide where to go on holiday this year. Last year we went on the most insanely brilliant holiday to California and had an unbelievably wonderful time. I miss it so much, San Francisco is my favourite city ever! So now we’re trying to decide how we can possibly have a holiday that can live up to that. The answer is we probably can’t. But we’re going to give it a good old try. So where shall we go? We’re thinking maybe South Africa. Somewhere in Europe? Barcelona or Berlin or Croatia. There’s just so many places! Anyway, I realise this is not actually a problem at all but a very exciting situation that I cannot wait to resolve so I can start getting excited about holiday! Anyway, on to this nice healthy recipe! It’s not very often we eat dinners like this. Mostly we eat what I would describe as carbs and comfort food. I’m all about pasta and polenta and any other carb. We eat lots of veg too but it’s usually surrounded by cheese and on top of lots of yummy stodge. These green quinoa bowls are a nice healthy break from that tradition! My favourite thing about them is all the blended up herbs which get stirred into the quinoa. It’s such a delicious way to give flavour to an otherwise bland grain. We used a mixture of dill, mint and chives blended together with a garlic clove and a little oil to get an incredible herby paste. Then I stirred it through the cooked quinoa just before serving and it just looked so lovely and vibrant and tasted amazing. 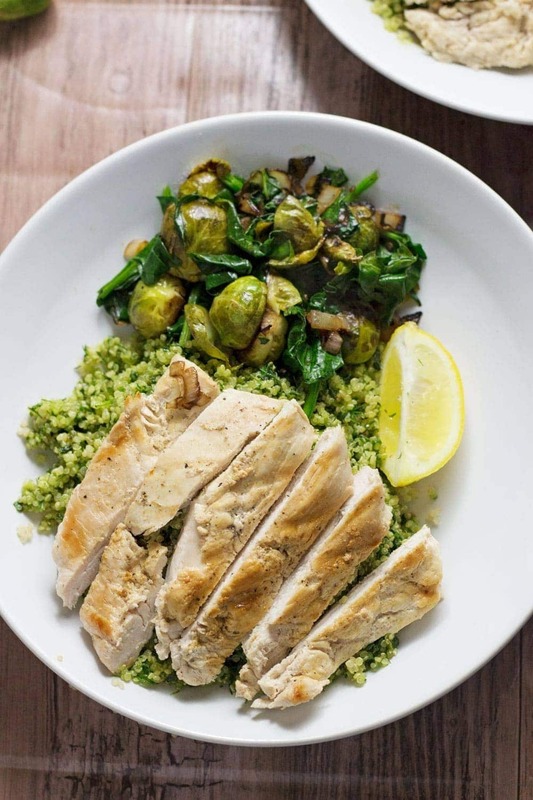 Add to that some Brussel’s sprouts fried with shallots, balsamic and a handful of spinach thrown in at the end and top with a griddled chicken breast and you’ve got yourself one delicious, healthy green quinoa bowl! 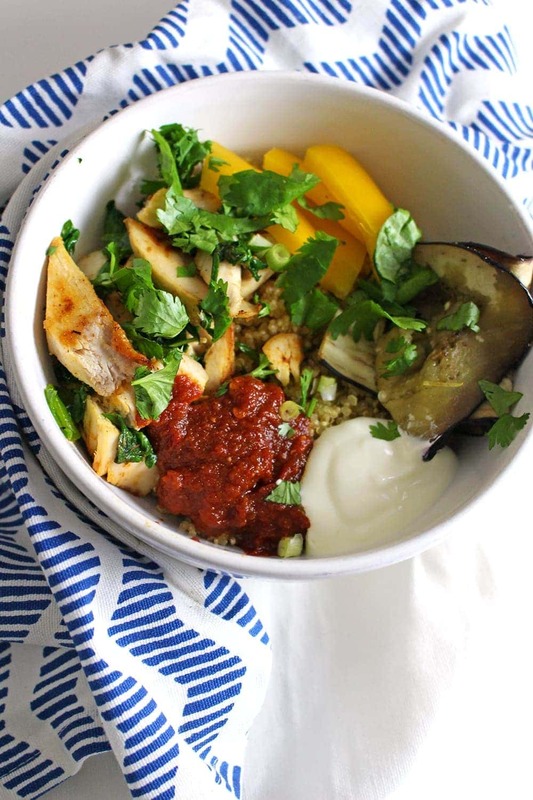 WONDERING WHAT TO DO WITH THE LEFTOVER INGREDIENTS YOU’VE GOT ONCE YOU’VE MADE THESE HEALTHY GREEN QUINOA BOWLS WITH CHICKEN? Place the fresh herbs, garlic clove, juice of one of the lemons and a tablespoon of olive oil into a food processor and mix to a paste. Stir through the quinoa and set aside ready for serving. 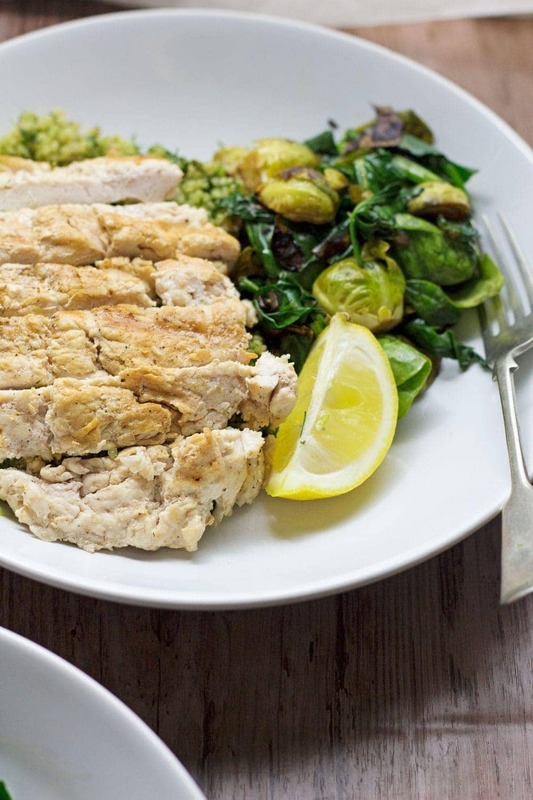 Coat the pounded chicken breasts with a tablespoon of the olive oil and a little salt and pepper. Heat a griddle over a medium high heat and then griddle the chicken breasts for 2-3 minutes on each side until cooked through and browned. 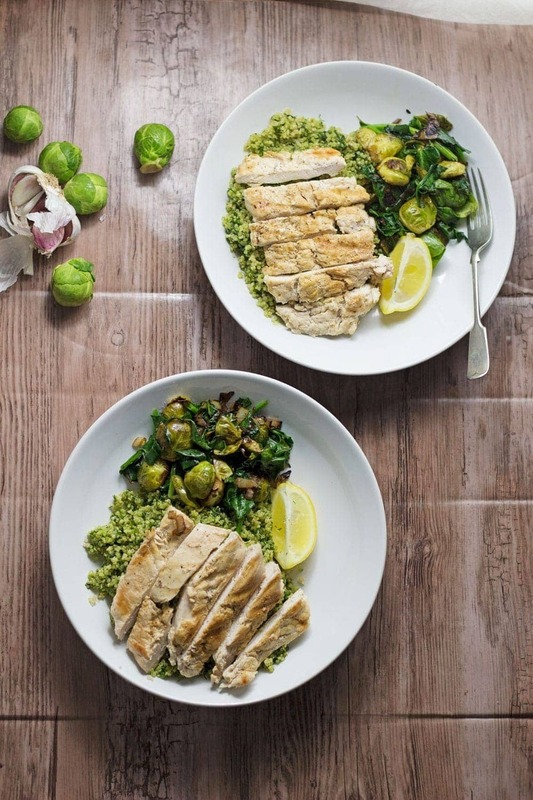 While the chicken is cooking heat the other tablespoon of oil in a frying pan or skillet and add the Brussels sprouts and shallot and saute for 5 minutes. Add the balsamic vinegar and cook until the sprouts are cooked with a little bit of a bite left. Add the spinach and let it wilt before removing from the heat. Split the quinoa between two bowls. 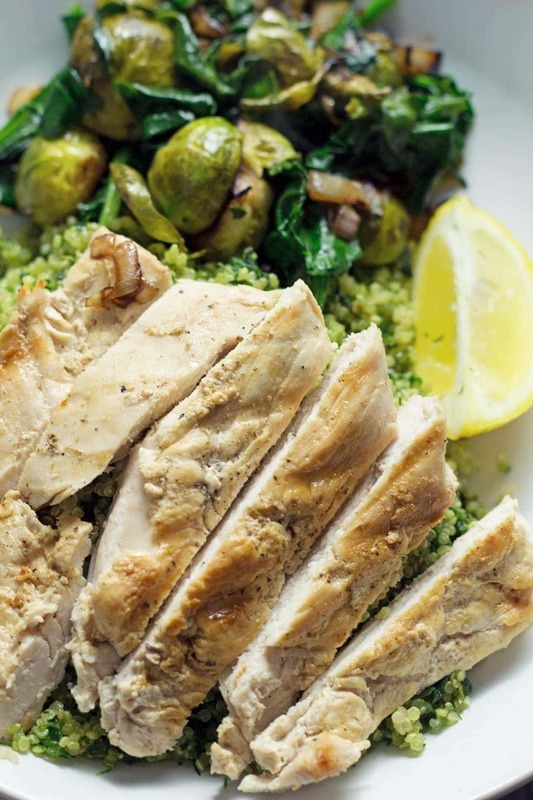 Slice the chicken breasts and place on top of the quinoa along with a helping of the sprouts and spinach mixture. Serve with lemon wedges to squeeze over the top. Good looking food, must be tasty! 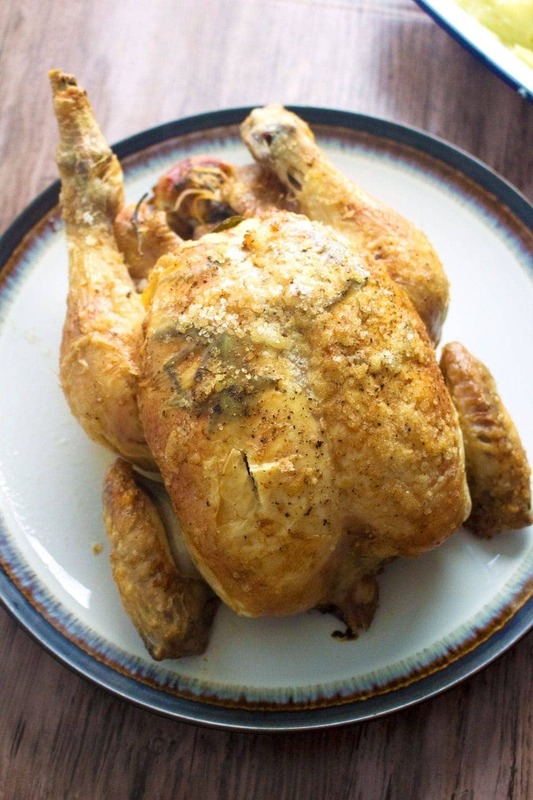 I love the sound of this, what a great weeknight dinner! This is perfect because life is fast-paced no matter how you try to slow it down, we’ve been looking for shortcuts to dinner. Thanks for sharing this recipe. 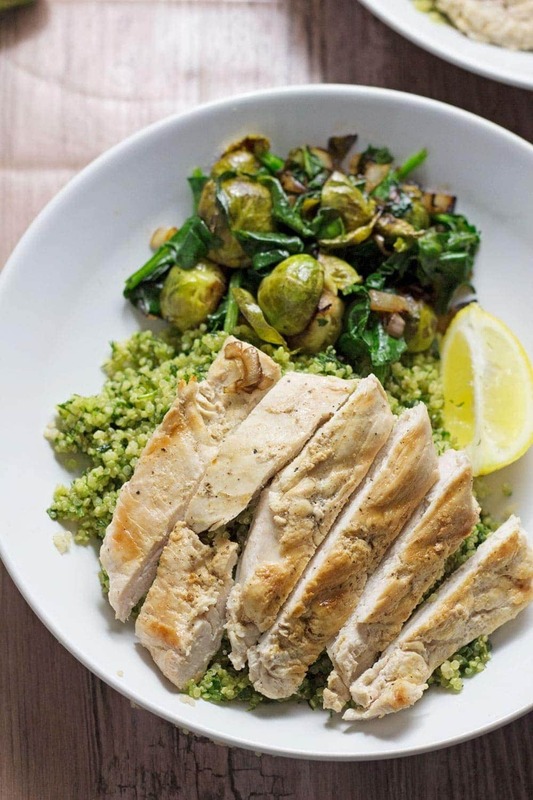 This is a gorgeous meal, I love the bright green quinoa! I loved how you turned the quinoa green. The ingredients sound delicious! Looks lean, healthy, and packed with fresh flavors!